No. 58 on the left of the above photograph and No. 59 in the middle are the two halves of a fine Georgian house, which is Grade II listed (List Entry No. 1047283). The present No. 60 on the right was rebuilt in the 1930s, and is now linked to No. 59 to form one shop. These houses were in St Peter-in-the East parish until that parish was united with St Cross parish in 1957. Thus the 1851 census shows James Millard living at No. 58 (now 58/59) with 23 boarders aged from 8 to 16, plus the school matron, the school cook, and two housemaids. He was still there in 1861 with 48 boarders and six servants. From 1861 the school also occupied the house next door, No. 57. Richard Hill was the next Master, and in 1871 his wife was here with their six children and 24 boarders. Similarly in 1881 the then Master, the Revd Harmer C. Ogle, lived here with his two spinster sisters Helen and Camilla, and 33 boarders aged from 12 to 18, plus the school matron, cook, and six domestic servants. In 1894 the school moved across the road into its new building on the west side of Cowley Place. 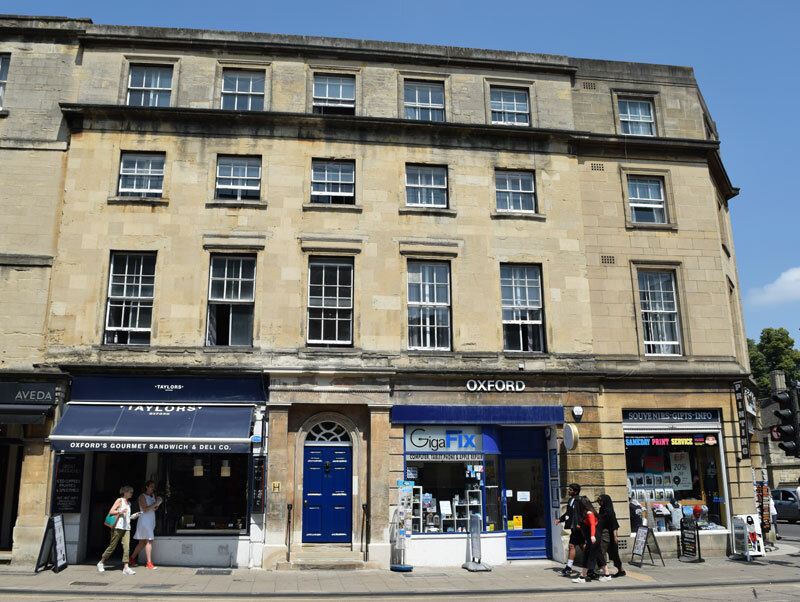 Soon after Magdalen College School had moved out, the Georgian house previously numbered 58 was divided into Nos. 58 and 59, with the former shop at the corner that had been No. 59 being allocated the number 60. This was a printseller's shop and a tobacco store, and finally an umbrella makers. At the time of the 1841 census the printseller William Thompson lived here over his shop with his wife and three young children and two female servants. The new shop at No. 60 had opened as Halford's Cycle store by 1939, while No. 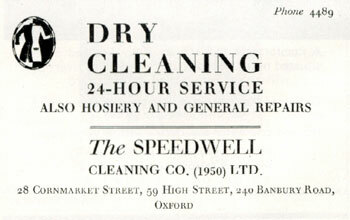 58 was an antique shop and Speedwell Cleaners were at No 59. At the end of the 1960s the shops at No. 59 and 60 were combined into one.